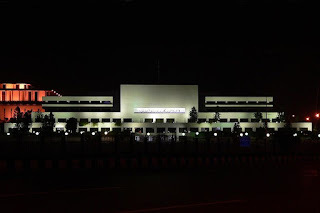 Pakistan Parliament - How far democracy will go? According to The Economist report "There is a small space in which a liberal vision of Pakistan hangs on. It shrank a lot further with the murder on January 4th of a notable progressive politician and critic of religious extremism, Salman Taseer". Mr Taseer was a leader of leader of ruling PPP (Pakistan People's Party) and Governor of Punjab. He was killed on the streets of Islamabad by his own body guard for running a campaign against the dreaded blasphemy law. The loss of Taseer is indeed a blow for Pakistan, which is already experience an acute shortage of progressive politicians. The more shocking aspect of this murder is that the assassin become a hero in Pakistan for his action. According to Washington Post's report "outside the confines of Salman Taseer's cordoned-off funeral, his suspected killer was also lauded as heroic - for having slain a liberal politician who had dared to speak out against Pakistan's stringent anti-blasphemy law." This is one fall out of mixing politics with religion. In Pakistan, barely any lines separates politics from religion. Because of this anyone can rise a religious call for each and every political decision, governments will be forced to reconsider their stand, any changes in laws to make it more liberal will be resisted. As religious principles usually have more than one meaning, people can interpret in different ways adding their own views to it. The problem was the product of existing laws for blasphemy. The current problem started with the court order for the execution of Asia Bibi in a blasphemy case. According to Asia Bibi's story in Wikipedia "In June 2009, Asia Bibi(mother of five), a farm hand from the village of Ittan Wali in Sheikhpura District, was asked to fetch water; she complied, but some of her fellow Muslim workers refused to drink the water as they considered Christians to be "unclean".Apparently some arguments ensued. There had already been a running feud between Bibi and a neighbour about some property damage. Later some coworkers complained to a cleric that Bibi made derogatory comments about Muhammad. A mob came to her house, beating her and members of her family before she was rescued by the police.However, the police initiated an investigation about her remarks resulting in her arrest and prosecution under Section 295 C of the Pakistan Penal Code. She spent more than a year in jail. In November 2010 Naveed Iqbal, judge at the court of Sheikhupura, Punjab, "totally ruled out" that there was any false implication, saw "no mitigating circumstances", and sentenced her to death by hanging. Additionally, a fine of an equivalent of $1,100 was imposed"
Section 295 forbids damaging or defiling a place of worship or a sacred object. Section 295-A forbids outraging religious feelings. Section 295-B forbids defiling the Quran. Section 295 require that an offence be a consequence of the accused's intent. Defiling the Quran merits imprisonment for life. Defaming Muhammad merits death with or without a fine. Section 298 states: Whoever, with the deliberate intention of wounding the religious feelings of any person, utters any word or makes any sound in the hearing of that person or makes any gesture in the sight of that person or places any object in the sight of that person, shall be punished with imprisonment of either description for a term which may extend to one year, or with fine, or with both. Section 298-A prohibits the use of any derogatory remark or representation in respect of Muslim holy personages. Section 298-B and section 298-C prohibit the Ahmadiyya from behaving as Muslims behave, calling themselves Muslims, proselytizing, or "in any manner whatsoever" outraging the religious feelings of Muslims. Violation of any part of section 298 makes the violator liable to imprisonment for up to three years and liable also to a fine. In addition to this the alleged blasphemy may neither be stated in the charges nor repeated in court, since that would in itself be an act of blasphemy. There is no doubt that the killing of Taseer and lauding his killer as hero is showing the increasing intolerance among the people. Because of this action it will be more difficult for the moderates to express their opinions in public. This incident also raises many questions, what will happen if Pakistan's nuclear arsenal fell in to the hands of extremists? As the killer is from the elite SSG, is it showing the increasing penetration of extremists in Pakistan's army? What will happen to the religious minorities in the state? What will happen to Sherry Rehman - who introduced the private bill in Pakistan's assembly for reforms of blasphemy law?Will the Pakistan's fragile political establishment, able to withstand this political storm? and what is Asia Bibi's future? Pakistan government already ruled out any reforms to the blasphemy law, Religious Affairs Minister Khurshid Ahmed Shah interrupted the house proceedings to make a policy statement "with full responsibility" that the "government has no intention to repeal the anti-blasphemy law and to disown a private bill of a PPP member proposing changes in the Zia-era law to abolish a mandatory death sentence against a convict provided by it and to guard against miscarriage of justice." We can only hope that, Pakistan will come out of this turmoils and become a responsible and stable democracy.